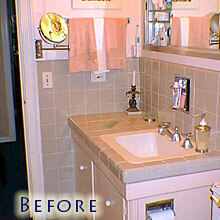 Project postscript: Note the vintage toothbrush / tumbler holder which revolves into the wall over the sink. I have fond memories of this feature from a bygone era when families shared a single tumbler, and toothbrushes were allowed to share their bacteria in an enclosed moist space all day long! When closed, its shiny chrome surface is also a handy mirror at a height perfect for kids. I'm glad we were able to keep it! To Gut . . . or Not to Gut? 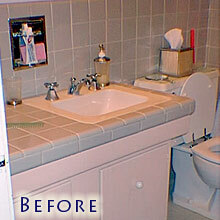 I'd lived with this bathroom for over 40 years and had lots of ideas for improvement. Gutting would be overwhelmingly expensive and messy, so we decided to stick with the original floor plan and tried to creatively embrace the existing features that were most difficult to replace. We left the tub and toilet in place and decided also to keep the tile. This square porcelain "mid-century modern" tile was used in all the nearby homes but we were luckier than some with the color: a rather pleasing green-gray, though a bit tricky (too green to be neutral and too gray to be really green). 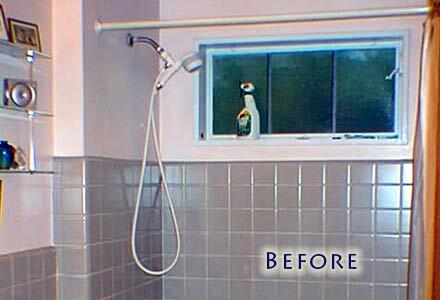 My goal: make our "new" bathroom look like we planned it all along! 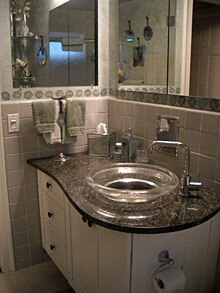 Vanity with two Bertch units: one side with drawers (excellent storage!) and one with cabinet doors to accommodate pipes. © 2009 Becca Taylor Gay | All Rights Reserved.